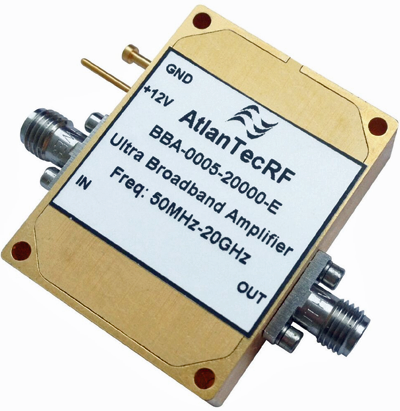 AtlanTecRF has launched a new Ultra Broadband Amplifier that covers the 50MHz – 20GHz frequency range, all in a single unit. This 25dB gain block delivers up to 18dB at 1dB compression and yet has a typical noise figure of just 1.8dB, thereby making this unit an all round, general purpose amplifier with applications in test measurement, electronic countermeasures and scientific research as well as a whole range of communication equipment. This new model draws just 180mA from a 12V DC supply, exhibits 27dBm third order intercept and output VSWR down to 1.5:1, while another key feature is its reverse isolation of 60dB. Vital statistics in the environmental area include altitude up to 60,000 feet, vibration to 25g RMS and relative humidity of 100 percent at +35C temperature. Connectors are SMA female and the gold-plated housing size is only 1.18 x 1.58 x 0.47 inches with an overall weight less than 160g. The new BBA Amplifier is available in both an epoxy sealed version with an operating temperature range of -45C to +85C or a laser welded version extending the temperature range to -55 to +125C. Geoff Burling, AtlanTecRF’s CEO, said that in listening to customers, the company knows that affordable performance is at the top of their wish list and this new Amplifier, with a multitude of applications, delivers big time on this need.